Delhi University Student Union Election Live Counting Result 12-09-2018 – Delhi University announced a student union election which may be held on 11 September 2018. The students of Delhi University check their name in voter list for voting. Many students can fill nomination form for the post of President, Vice President, Joint Secretary (JS) and Secretary (GS) related to different main contesting parties i.e. BJP supported ABVP (Akhil Bhartiya Vidhyarthi Parishad),Congress supported NSUI (National student union of India) etc. Candidates work hard for canvassing at students homes, colleges and hostels. The students of different colleges also affiliate and participate in the Delhi University Student Union Election (DUSU). Candidates declared manifestos and plans for students welfare and promise to work hard for resolution of difficulties and winning. In this reference NSUI promises to resolve many matters. The ABVP won three posts while the NSUI won one. The ABVP continued their dominance in the Delhi University Student Elections. While the BJP’s student wing won 3 seats, the Congress-backed NSUI won one seat. 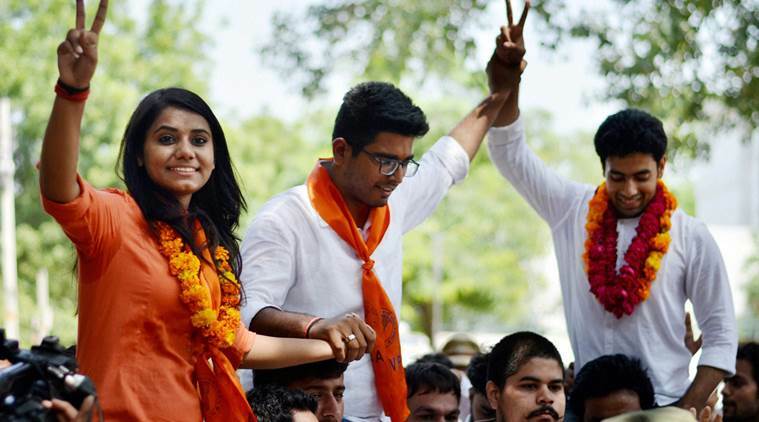 While ABVP’s Amit Tanwar won the President’s seat, Priyanka Chabri was elected Vice President. Ankit Sangwan, also of the ABVP won the Secretary post. The NSUI’s Mohit Garid won the Joint Secretary seat. Student supporters had started gathering as early as 7 at the campus and the counting started around 7:30. The run-up to the counting till the final results came out was a cocktail of various emotions for both NSUI and ABVP candidates as well as their supporters. Stress, anxiety, exhilaration, dejection, the campus experienced myriad feelings as and when numbers trickled in. Akhil Bharatiya Vidyarthi Parishad (ABVP) an outfit affiliated to the RSS, won the position of President, Vice President and Secretary for Delhi University Student Union (DUSU) election which were held on Friday. National Students’ Union of India (NSUI) backed by Congress was won the position of Joint Secretary. Amit Tanwar has been elected as the President, Priyanka Chabri as Vice President, Ankit Sangwan as Secretary and Mohit Sangwan (NSUI) as Joint Secretary. The ABVP winners distributed sweets among students and supporters. According to students, a “massive” victory procession will be soon held to celebrate the victory. Two major Left parties — Students Federation of India (SFI) and All India Students Association (AISA) — had formed an alliance to against the main opposition, BJP-affiliated Akhil Bharatiya Vidyarthi Parishad (ABVP). Last year, ABVP had won all four seats. The AAPs student wing is not contesting the polls this year. ABVP was leading from the beginning but two hours into the counting, arch rival NSUI claimed to win 33 out of 40 colleges, which sent shock waves in the ABVP camp. This is for the consecutive third time the ABVP has emerged victorious in DU polls. While on the previous two occasions, it was a clean sweep across the panel, nearest rival NSUI did stake a claim on one of the seats this time. Social media was abuzz with congratulatory messages to ABVP for sweeping DU polls this year as well, with most of them claiming it to be a triumph of nationalism. 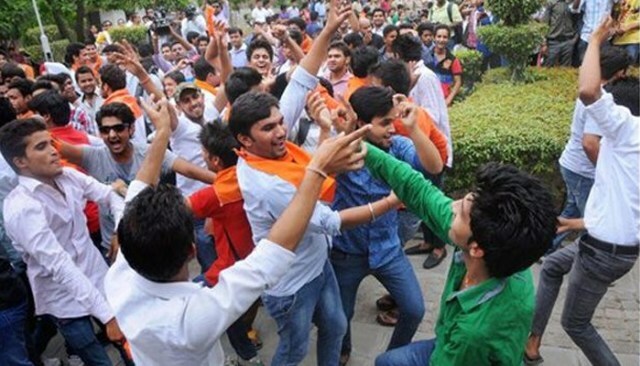 ABVP has been under severe criticism of late in another major varsity, JNU for 'saffronisation' of the campus but the north campus of DU on Saturday actually turned into a riot of saffron colour as the party thumped to victory. Over 36 per cent of students exercised their franchise yesterday in the keenly contested Delhi University Students' Union (DUSU) polls with the voting percentage recording a dip of over 7 per cent from last year's overall turnout of 43.3 per cent. Meanwhile, the students council elections also took place in 44 colleges where Congress-affiliated National Students Union of India (NSUI) won the five-member panels in 33 colleges while the BJP's student wing Akhil Bhartiya Vidyarthi Parsihad (ABVP) emerged victorious in 11 colleges. While DUSU is the representative body of the students from most colleges and faculties of the varsity, colleges have their individual students' councils. The Chief Election Officer for DUSU elections, D S Rawat, said the voting went off peacefully with 35.89 per cent of students casting their vote in the morning leg of polls. "The polling which was conducted in two phases went off smoothly. The maximum turnout of 91 per cent was recorded at the Ayurvedic and Unani Tibbia College and the minimum was in Campus Law Centre II at 6.79 per cent," he said. "Minor technical glitches were reported in Aurobindo College in the morning phase but was rectified within a few minutes," he added. Chhatra Yuva Sangharsh Samiti (CYSS) is a new party in this battlefield. It has that fresh zeal and vigour in itself that is rare to see in the youth. They are ready to take on the parties which are much older and experienced than CYSS. The trigger factor in the case of CYSS is the victory its supporting party Aam Admi Party in the Assembly polls. The CYSS, being a new warrior has to prove its capacity and strength in front of ABVP and NSUI. The National Students ’Union of India (NSUI) is one of the oldest parties in this war. The NSUI is putting in its utmost effort to regain its throne from ABVP. This intense desire to hit back in the DUSU politics is the trigger for the candidates and supporters of NSUI. NSUI, not only has to dethrone BVP, but also obstruct the CYSS from becoming a tough rival. NSUI, like ABVP, could never allow a new warrior to survive in DUSU. Though there are other parties contesting in the Delhi University Student’s Union (DUSU) Elections 2018 who prove to be the dark horses, but the fight between ABVP, NSUI and CYSS is considered to be the most crucial and exciting one.